Founded in 2009, after a traditional water heater broke down and flooded our founder, Sridhar Deivasigamani’s basement, Intellihot today designs, manufactures and assembles tankless water heaters for residential, commercial and industrial applications — the first to do so entirely in the United States. Quality and innovation are at the heart of all our products, which were developed following years of extensive research. We continue to be recognized for our innovative design, and we currently have over 60 awarded and pending patents. 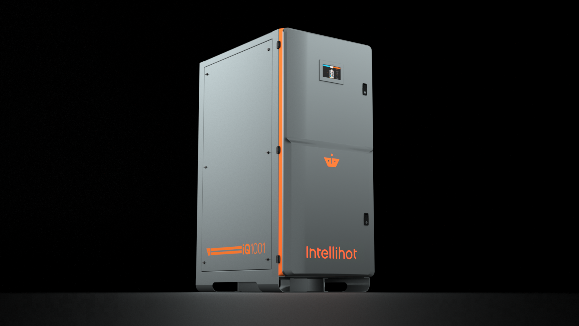 After years of research, Intellihot has created a revolutionary heat exchanger that is the best in the industry. At the heart of our heat engine is a single-finned stainless coil that is designed to float freely. This unique feature allows for rapid thermal cycles by allowing the coil to expand or contract. Cold water enters the coil at the bottom and is carefully heated to the correct temperature before emerging at the top, ready for use. The modulating premix burner fires radially outwards to precisely match the load. By condensing the flue gas, we’re able to absorb 12% more heat than in other models. The condensate flows downward in the same direction as the flue gas, thereby preventing any gas side fouling. Flue gases move downward to the bottom casting while water flows in the opposite direction, collecting maximum heat along the way. Using our patented vibration and turbulent-flow technology, our heat exchangers possess the unique ability of being “self-descaling,” keeping lime scale in suspension and ensuring years of like-new operation. These features and many others can be found in our line of Intelligent water heaters — only from Intellihot. telliBot is not only a state-of-the-art, IoT and Wi-Fi enabled, smart condensate neutralizer, it can also “smartify” your boiler room through robotic controls that transform every water heater or boiler into a smart device. Monitor water temperatures. Using a clip-on probe, the user can monitor the boiler or water heater supply/return temperatures. Prevent leak damages. A built-in leak sensor notifies the user of any water leaks in the boiler room or condensate backups. If the optional water valve kit is installed, telliBot can shut off the water and turn off the boiler or water heater. Gas and carbon monoxide safety. A carbon monoxide and flue-gas sensor notifies the user of any leaks. If the optional gas valve kit is installed, telliBot can shut off the gas. Calculate cost savings opportunity. Monitor hot-water demand and draw profile if the optional flow sensor kits installed. Mobile app. 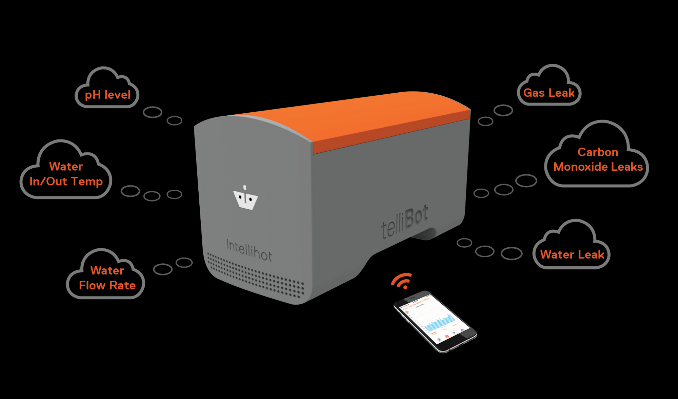 telliBot comes with a mobile app that sends automated notifications. Prevent corrosion damage. telliBot monitors the neutralizer media usage and sends a notification through an app when it is time to replace it. No more guessing when to reload the media and risk corrosion damage. Never out of media. When subscribed to telliBot service, we notify and ship the media before it is used up. 24/7/365 monitoring. With telliCare, your units will be monitored 24/7/365 by factory personnel and, should any problems arise, they can take appropriate action remotely. Free parts. We proactively monitor the wear and tear of parts and ship you those parts ahead of time, so that you can schedule service. You can rest assured that your system will always be kept in like-new condition. Notifications. telliCare monitors various parameters and sends appropriate notifications alerting of potential issues. These notifications can be delegated to the appropriate maintenance person or contracting company. Automatic firmware updates. With telliCare, your unit will be kept updated with the latest software and updates. Prognostics and predictive analytics. Our advanced predictive analytics make these reports available on your mobile device. BTUs, Firing Rate and Flue Gases. We monitor the BTUs generated by your water heaters on a daily, weekly and monthly basis. Temperature Monitoring. We monitor the inlet/outlet temperatures of the water being heated. Flow Rates. We monitor your flow rates on an hourly, daily, weekly and monthly basis. Longevity of parts. We monitor the longevity of the parts in your units and, based on their remaining life, we predict when replacement parts will be needed.